"Hi All! 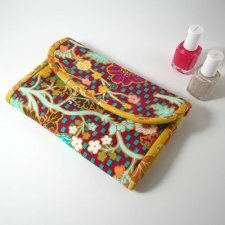 Rashida visiting again from, I Heart Linen land with my second tutorial for the Fat Quarter Gang! Today I've put together a super simple and easy tutorial for a manicure kit. Just in time for the holidays, I think it would make such a cute gift for a friend or loved one. "It opens up with ample room for all the tools one would need to keep those fingernails looking lovely. (You know all that typing and texting can take its toll on the digits. ^_~) It then folds up nice and compact to be taken along with you. The design is pretty basic, but it's perfect launch pad to take the design and really make it your own. Let's take a look!" 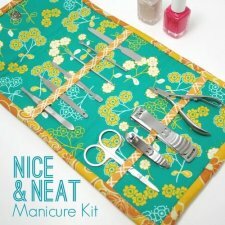 What do you think of this manicure kit?